Outdoor lighting can be a beautiful addition to any home. But as you design your outdoor lighting system, you need to beware of the great nemesis of outdoor lighting: voltage drop. In this article, we will discuss the causes of voltage drop, the problems it creates, and how you can design your system to avoid it. Once you learn how to avoid voltage drop in outdoor lighting systems you can start to design a better system from the start and avoid problems down the line. Voltage drop is a problem that plagues low voltage outdoor lighting systems. It is caused due to the fact that a 12-volt low voltage systems run a higher current than your household 120-volt system to send the same amount of energy (measured in Watts) to the lighting fixtures. With a higher current, resistance becomes an issue. Due to the higher resistance, voltage drops over the length of the wire. For a low voltage lighting system, that means that the fixtures farthest from the energy source, in most cases a transformer, will receive significantly lower voltage. Modern outdoor lighting systems usually use LED lamps. In fact, at Night Vision Outdoor Lighting, we use LED lamps exclusively. One benefit touted by the manufacturers of LED lamps is that LED lamps can function with a range of voltages. In other words, even if you get a slightly higher or lower voltage, the light will shine the same. However, that’s only part of the story. While an LED lamp can function within a range of volts, unless it is getting its ideal voltage it will not last as long. Sending too many or too few volts to an LED lamp will either reduce the lifespan or the brightness of the lamp, respectively. Despite what the manufacturers say, if you want to get the most out of your outdoor lighting system, you need to make sure that each fixture is getting as close to 12 volts of electricity as possible. Unfortunately, some of the most common wiring styles for outdoor lighting don’t achieve that at all. However, there are ways that you can adapt your wiring to get better results. The daisy chain is one of the most common methods of wiring an outdoor lighting system. Unfortunately, it has many drawbacks. In a daisy chain setup, a wire is run from the transformer to the first fixture. This is often called the home run. The first fixture in a daisy chain will receive the most power. After the first fixture, a wire is run to the second fixture. That second fixture will receive less power than the first. As the chain continues, each subsequent fixture receives less power. This is a prime example of voltage drop. The extent of the voltage drop depends on the wattage of the lamps in the chain and the length of the wire runs. For most purposes, the daisy chain is the least effective method of wiring an outdoor lighting system. However, there are some instances where it can be useful. If you are installing lights in hard-to-reach places, like on a second floor or a tight space in a home’s architecture, a daisy chain may be the most effective way to get power to multiple lamps. Even so, the daisy chain should only be used when installing lights above ground. As we will see, the disadvantages of the daisy chain are significantly increased when you install it underground. 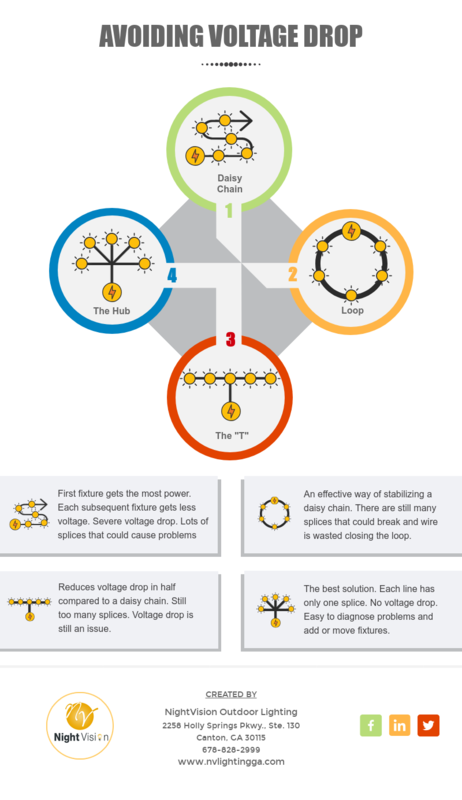 One of the main issues with the daisy chain, besides voltage drop, is that you have a large number of connections. In fact, at each fixture, the wire has to be spliced. This creates many more opportunities for wiring failures. If a splice is not perfect, it can result in a heat buildup. The heat melts the wire, and the lighting fixture fails. Water infiltration is also more common at splice points. Finally, since each lamp is wired to two other lamps, it makes it hard to change a layout. Designing a lighting system with the potential for repositioning of the lamps is crucial because landscaping is prone to change over time. All of these issues are multiplied if the wires are buried underground. One modification that can significantly reduce voltage drop in a daisy chain is to run one more wire form the final fixture back to the transformer, creating a closed loop. This means that both the first and the last fixture are receiving the ideal voltage, which stabilizes the voltage throughout the loop. The main thing to watch out for in a loop setup is making sure that the polarity of the wires matches all the way through the loop and back to the transformer. If the polarity gets reversed, you could short out the system, damaging the fixtures and possibly endangering anyone nearby. The loop is an effective way of stabilizing an existing daisy chain. However, it retains many of the disadvantages as well. First, there are still many splices along the loop, and each splice is an opportunity for damage. Also, it can waste a lot of wire. If you have a daisy chain that runs some distance from the transformer, you will have to run a long wire from the end of the chain back to the transformer. That basically doubles the amount of wire the system requires. The “T” layout is somewhat less common than other methods but is a significant improvement on the daisy chain. In the “T” layout, a single heavier-gauge wire is run to the center fixture. From there, the run splits off in two directions, with the fixtures daisy chained in either direction. This effectively cuts the voltage drop in half, since there is half the length and half the number of fixtures extending out from the home run. However, it still maintains many of the same issues as the daisy chain. First, it doesn’t do anything to reduce the number of splices. Second, the daisy chain is cut in half, but it still has the voltage drop issue. One way to minimize voltage drop is to combine the “T” and the loop. The “T” layout is far from perfect, but it can be a useful improvement over the classic daisy chain when you need to get lights into hard-to-reach spots above ground. 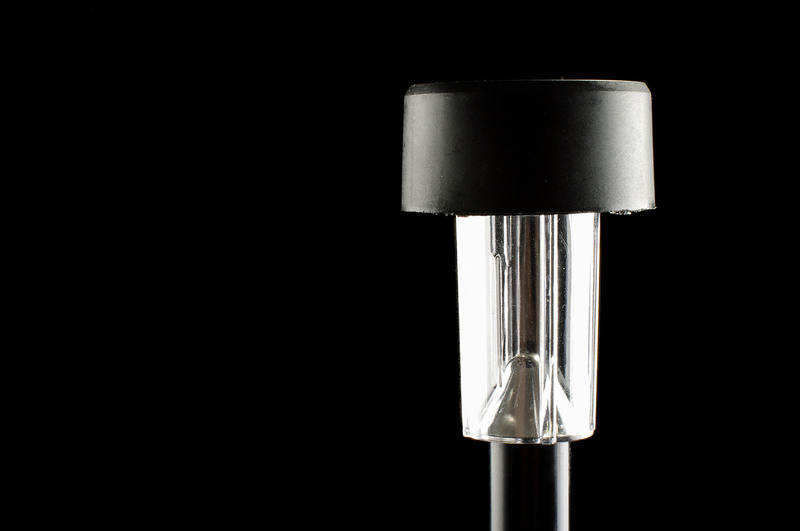 The hub method is the gold standard and should be the first choice for every outdoor lighting installation. In the hub layout, a single run of wire is run from the transformer to a hub. Each fixture is then wired individually to the hub. There are many advantages to the hub method. Every fixture receives the same voltage. There are no underground connections. Because each fixture is individually wired, it is easy to move them around. It’s easy to add fixtures. Nothing needs to be moved around or spliced. Saves money on wire by using less length and a lower gauge. Reduces the amount of splicing, thus reducing labor costs on installation. If you are thinking about installing an outdoor lighting system for your home, you have two main choices. You can try to do it yourself, or you can hire professionals like Night Vision Outdoor Lighting. The internet is full of do-it-yourself guides to outdoor lighting installation, making it seem like an easy project. But the risks of designing and installing your own system are rarely discussed. Without the years of experience and thousands of job completed by Night Vision Outdoor Lighting, there is a very high probability that your system will not have the optimal wiring. Remember, imperfect splices and poorly designed layouts can cost you time and money in failed fixtures and burned out lamps. If you really want your outdoor lighting system done right, contact Night Vision Outdoor Lighting for your free consultation. You’ll quickly see the difference experience makes.